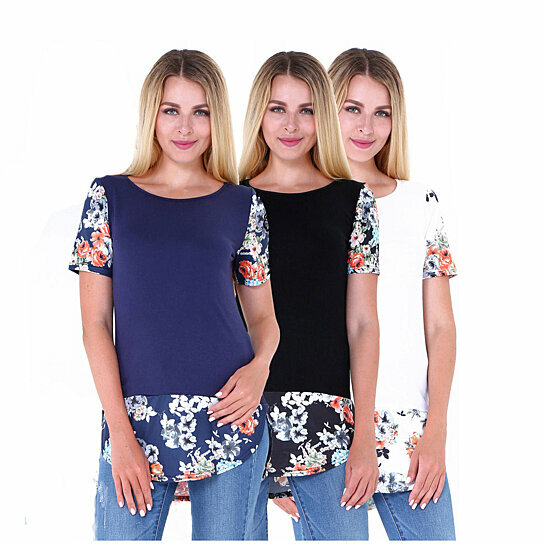 The top has solid colors with innocent flowers on the sleeves and at the hemline, giving it a breezy and refreshing feel ...Whenever you wear this tunic top, you will not only look beautiful and feel like your happy self but also will give positive vibes to your friends that make them want to spend more time with you! Made of 5% Spandex and 80 Cotton 15% Polyester blend. It has sweet boatneck design and short sleeves, perfect for summer. The breezy flower panel softly drapes below the waist for more leaner and taller appearance. It comes in sizes S, M, L, XL, AND 2XL. See size chart for details. It comes in Pure White, Blissful Black, and Joyous Blue. Small - Bust 35.5in / Length 25in / Sleeve 8in. Medium - Bust 37in / Length 25in / Sleeve 8in. Large - Bust 38.5in / Length 26in / Sleeve 8.5in. X-Large - Bust 40in / Length 26.5in / Sleeve 8.5in. 2X-Large - Bust 42in / Length 27in / Sleeve 9in.